Did you know St Brides has an online book store? Chloe Berry is a final year Graphics Student at the Manchester School of Art University. She recently reached out to talk to me about the value of working analogue as research for an assignment which explored the tension between analogue and digital practice. 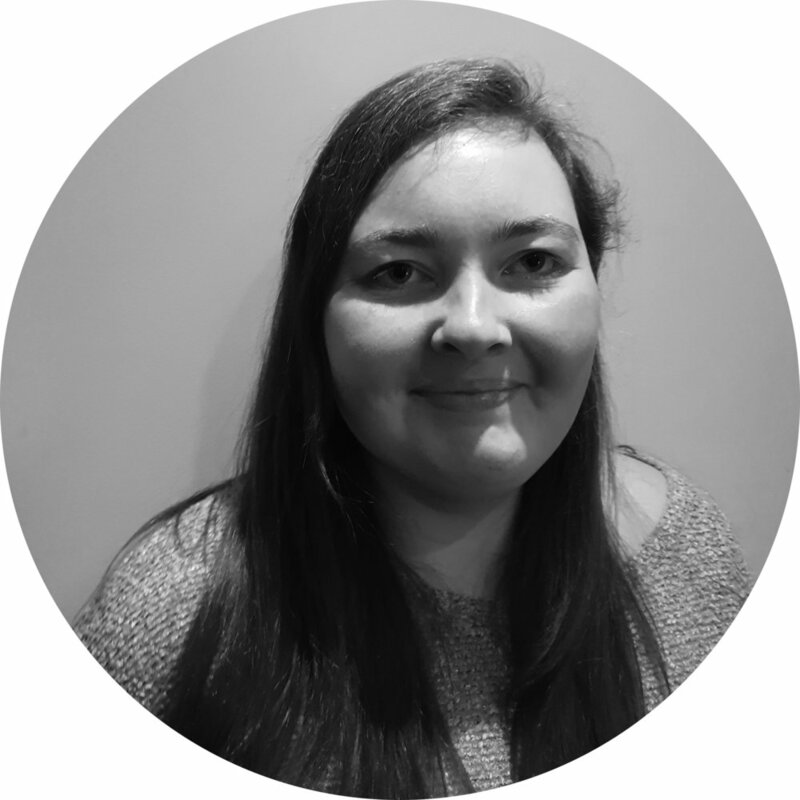 Her core interests were drawing, business studies and IT so she was keen to study graphic design and bring all three elements together. I asked her to tell me more about her work, creative practice and the Analogue/Digital project for this latest installment of the Student Spotlight. What was the most valuable lesson during your course? You shouldn't be afraid to try something new - trial and error is one of the important parts of the creative process to get to where you want to be with your projects. What about type, calligraphy and or lettering specifically interests you? There are endless typefaces out there. Some might have similarities but not one is exactly the same. I love that you need to think about the small details when using type, such as the kerning and leading, which show that type has some sort of instruction manual. Do you have a particular medium or tool that you gravitate towards or enjoy working with most? If so why? The medium that I love to use is lino or woodcut printing. Creating work in this style allows your work to have a sense of personality to it. Carving out on the chosen material is very time consuming but therapeutic and rewarding at the end. When printing with the carved piece, inking and placing it on the selected stock is very satisfying due to being able to get your hands dirty and involved. Each print is unique in its own way. To get an outcome you are happy with you have to do a number of prints. Don't ever be satisfied with the first impression! Deciding what paper stock to use is an important part of the process; how the paper feels, does the ink catch onto the paper? Choosing the correct paper is as critical as what type or image you are trying to show people. What did you learn about the construction of letterforms from making tactile typography with the beans? I learnt that you have to be loose otherwise the letterforms wouldn't look natural and flow. By letting the beans do what they want first you haven't forced anything. 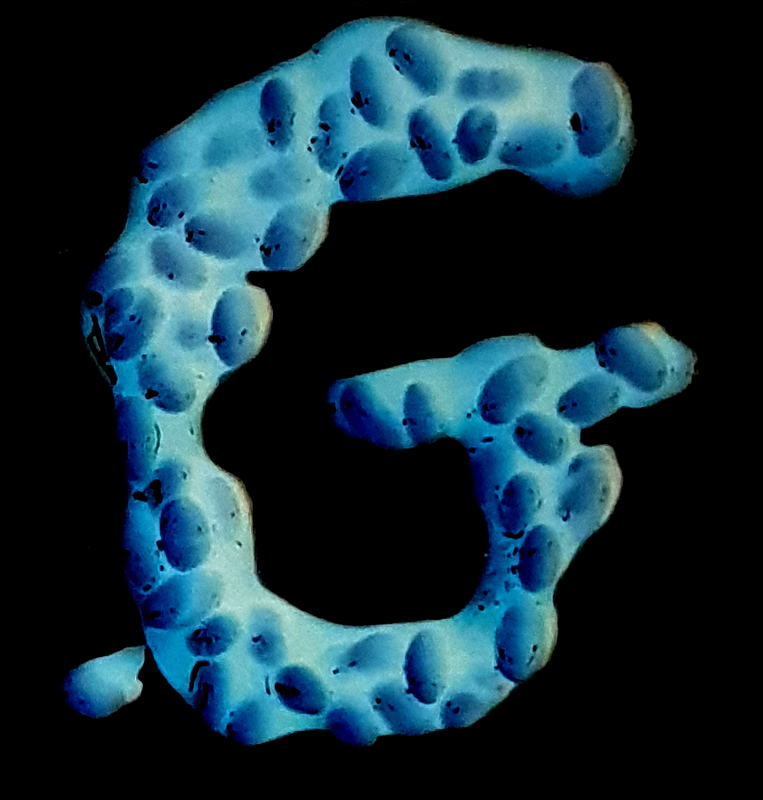 For this project I created the alphabet simply by using a spoon and forming the letters on a piece of paper before experimenting in Photoshop to make it look scientific. Once I had created the typeface I typeset scientific words out of them and made jokes to allow people to know what the long words meant. So the response was educational as well as enjoyable. I found that creating a tactile typeface, is relatable to more or less to anyone. Many households have a tin of beans in their cupboard! Using the word ‘GOOD’ Chloe created a publication showing the differences between analogue and digital mediums; lino print for analogue and geometric for the digital as these are the two techniques that make her feel positive when using them. Can you tell us a little about your analogue vs digital project - What was the brief and what did you learn about working with both mediums? For my Analogue & Digital project I got given the word 'GOOD' to explore. 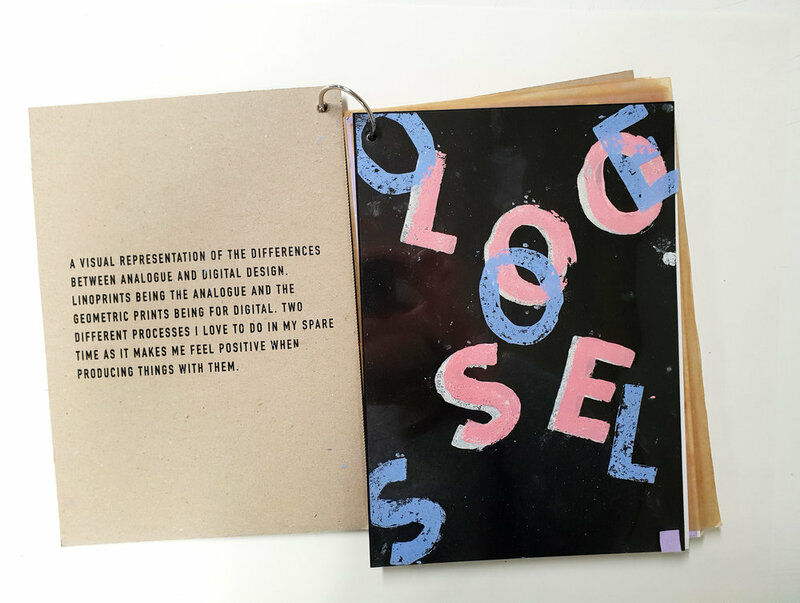 When I think of the word good the word "POSITIVE' comes to mind, so I decided to create a publication using two mediums that make me feel positive. I selected Linoprint for Analogue and then Geometric for Digital. I decided to use opposite words related to each technique and presented them as a publication. For the project you created moveable type with lino cut letters - how did you print them and what did you learn about the print making process from this method? When I created the moveable type with lino that I cut out by hand, I laid out where I wanted each letter to be when printed by using a pencil to make sure all the letters I wanted could fit on the stock. I then decided on what colour ink I wanted to use and then used a roller to roll the ink out to be thinly onto glass. I then used the same roller to then apply the ink on the letters. To then transfer the ink from the letter onto the stock I applied pressure. I then simply repeat the process until I had a finished print. 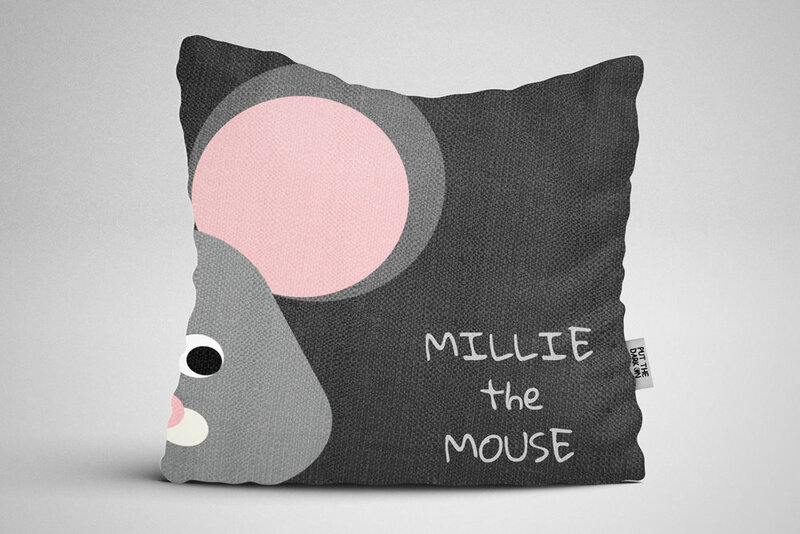 Chloe’s portfolio is also bolstered with illustration work, including a Nocturnal animal children’s book (and range of merchandise). In which all the illustrations were created with ellipse shapes. The geometry is juxtaposed with a casual vernacular lettering. What are your next steps career-wise? What does your dream job look like? Once I graduate I would love to find a job where I could still experiment and do things by hand but have the opportunity to create digitally too. I would love to work for a studio where they are open to new ways of working. I don't feel like I specialise in one area of Graphic Design, I like to learn new things and have a wide range of skills. But I love to create things to do with type and packaging, I also have a keen interest in animation, and illustration. Another of Chloe’s Tactile Type face experiments is for a ‘Beefsy’ exhibition aiding a local homeless charity called ‘Glass Door’. Chloe created artwork to promote a new beef Peperami and was one of 4 winners exhibited in Soho. There her work was silent auctioned and raised £1000 for this very good cause. How can people get in touch & see more of your work? Newer:Fab flat-lays and wonderous workOlder:Did you know St Brides has an online book store?